Cheiveley War Memorial – Dedication Service, 9 April 1921. A Union Jack covered the base of the column, and an enclosure of eight yards square was roped off. Whilst the main portion of the assembly marched in procession from the Old Infant School, the relatives of the fallen, many of whom were wearing the ribbons, service medals and awards of valour of the men who died, took up their position at one side of the memorial. The procession was led by Mr. J. Higgins carrying a Union Jack surmounted by a laurel wreath, then came the surpliced choir; the Rev. J.C. Pearson (Vicar of Leckhampstead) and Rev. G.D.M. Hughes (Curate of Curridge); Revs. B.H.B. Attlee, P. Jackson and T.W. Beck; Miss Fairhurst, Lieut. Colonel J.A. Fairhurst (in uniform), and a large number of people representative of all classes of the community, including many of the leading gentry of the surrounding neighbourhood. Upon arrival at the memorial the hymn “O God, our help in ages past” was sung, followed by prayers by the Vicar, and the lesson taken from the Book of Wisdom. After another prayer, the hymn “On the Resurrection morning” was sung. The Vicar, who was a Captain and Chaplain to the 63rd Royal Naval Division during the War, then delivered an address. He said the Cross was raised to the glory of their Lord Jesus Christ and in proud and thankful memory of those who gave their lives for God, King and Country in the Great War. Pride was a sentiment they could seldom safely indulge in, but they could and ought to be proud of them. Father, mother, sister, brother could say they were proud of those belonging to them who played the man, and went. The memorial was so plain and simple in its symbolism and its teaching that all could understand. There was the cross, the symbol of self-sacrifice, the hallowed emblem, the empty cross, the cross of glory reminding them of their Lord Jesus Christ who died for them and rose from the dead. It was the plain, simple message of the Christ Himself, who hung upon it, and who said “Greater love hath no man than this, that a man lay down his life for his friends”. On the cross was the sword, the sword of justice, the immemorial symbol of war. Wherever there was wrong and injustice and cruelty, the Christian had to fight. They did not like doing so, but they had to. Did not Christ Himself say: “Think not that I am come to send you peace on earth; I came not to send peace but a sword”. The sword was the symbol of the battle against lies, meanness, jealousy, deceit and selfishness in their lives, which they had to fight. They were pledged to be Christ’s faithful soldiers and servants unto their lives’ end, and there was no peace with evil. Lastly the laurel wreath, the symbol of victory. Those whom they commemorated gave their lives for a cause, which thank God, triumphed, but they did not reckon on that, they went to do their duty whichever way the combat went, and to fight on to the end. God in his mercy gave them victory. Let them use the cross. Let them never forget those men nor their example. And as long as the cross stood he trusted that all who passed by would see it in a call to duty, a reminder of Him, who called them to follow Him, and a record of the valour and endurance of those who had passed to be with Him. May they read their names upon the memorial and never forget them. Mr. Oscar Rayner then stepped forward and said that he had been requested by the Vicar, on behalf of the subscribers, to ask Miss Fairhurst to unveil the memorial. The Committee’s choice of Miss Fairhurst was a happy one, for she played her part nobly. She was one of the first to join up, and one of the last to be demobilised. She saw much of the horrors of war, and shared in many of its dangers. 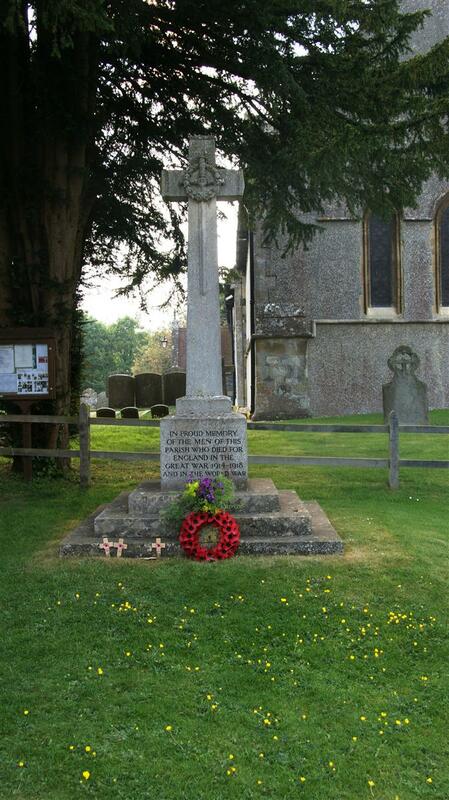 It was therefore with the greatest pleasure that he asked Miss Fairhurst to unveil the memorial to their dead. Miss Amy Fairhurst, attired in military uniform, wearing war ribbons, and four service chevrons, having spent over three years abroad with the First Aid Nursing Yeomanry, then proceeded to unveil the cross. She said it was a proud duty she had to perform, but a sorrowful one, when they thought of such fine fellows taken away in the prime of life. From her experience of the soldiers, she knew that would be glad that they were not forgotten, but also that they would not like a great deal said about them. She unveiled the memorial in honour, reverence and respect in memory of those whose names were inscribed thereon. They died that they might live. The Vicar then dedicated the memorial, and said; “Those whose names are inscribed on this memorial are numbered among those who at the call of King and Country left all that was dear to them, endured hardness, faced danger, and finally passed out of the sight of man by the path of duty and self-sacrifice, giving up their own lives that others might live in freedom. Let those that come after see to it that their names be not forgotten”. The Rev. G.D.M. Hughes read out the list of names, the Vicar then saying: “May the Lord in His mercy grant unto all the faithful rest and peace.” A pause for silence followed, and then a bugler, T. Bailey, formerly of the 1st Royal Berks, sounded the notes of the “Last Post”. The impressive ceremony concluded by all present singing the National Anthem. Many beautiful wreaths were laid at the foot of the memorial, including a large one of laurel leaves placed by Miss Fairhurst, and one from Chieveley Manor.